WizKids will release a new dexterity game set in the Star Trek universe in February. 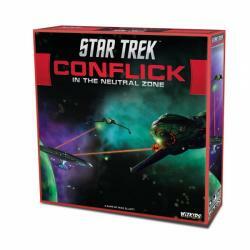 Designed by Mike Elliott (Thunderstone, Star Trek: Fleet Captains), Star Trek: Conflick in the Neutral Zone has the Federation and Klingon Empire vying to exploit the resource-rich planets of the Neutral Zone. Players flick discs representing various starships from the Star Trek universe in an attempt to collect resources or attack other ships. Players bring a ship within range of an energy or command point planet to collect resources. If a planet is already occupied, the player can attack the rival ship by knocking it off the planet or game board. This is not always easy though, because players can �defend� an area by putting asteroids in the way to block shots. Players can counter by buying more ships, increasing their fleet strength and numbers. If a player successfully removes a rival from a planet, they receive one command point. The first player to 10 command points wins. The box includes 1 map board, 26 ship discs in different shapes and colors (representing the race of ships and type of ship), 26 cards, asteroid, dilithium and command point cubes, and rules. The game is for 2 � 4 players, ages 14 and up, and plays in 20 minutes.